We've borrowed this recipe from our neighbors to the north to offer you this Epicurean delight. In Canada, it's called tourtiere. Made with potatoes, pork, beef and spices, and wrapped in a light and flaky crust. It's fully cooked and ready to simply warm and serve for a delicious gourmet meal in minutes. Each Meat Pie weighs, 35 oz. Just pop it in the oven and wait. Was totally delicious. I would order these pies again. The pie was so bland! I have lost my mother-in-law's recipe Tourtiere and thought this might save the day. Wrong! We ate 1/2 the pie and the rest went in the garbage...very sad. I'm not sure what spices were used, but it didn't spice up the pie one bit. The crust OK, but overall it wasn't a hit with my friends. 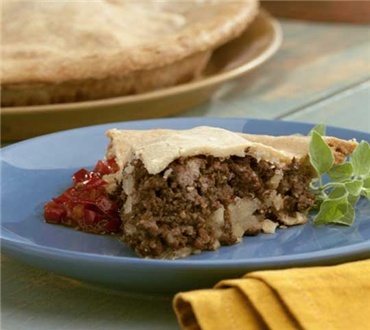 My husband grew up in Canada and "tourtière" aka meat pie was a traditional dish. He and the rest of the family were very pleased with Dankin Farm's French Canadian Meat Pie. The pie was beautiful and well packaged. However it tasted nothing like a traditional Canadian meat pie. We are Canadian and we have tasted many meat pies, this one seemed to be lacking the traditional spices. Our pies seemed to be ground meat and potatoes.